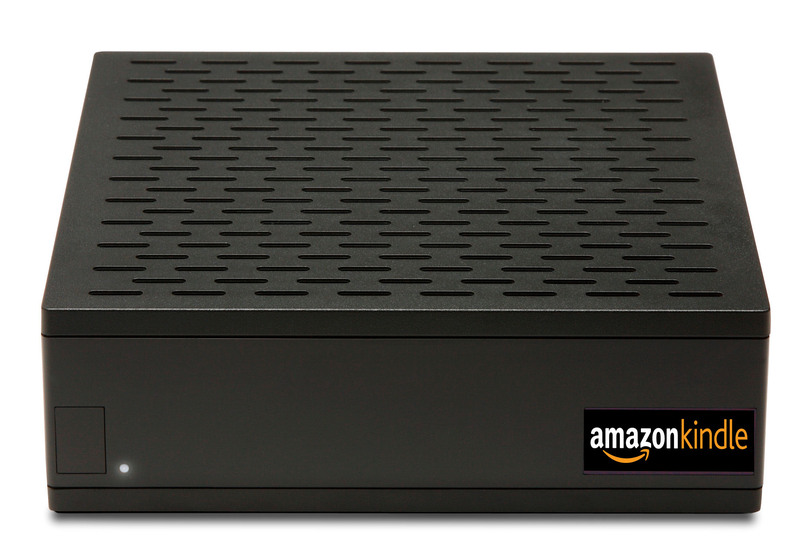 Is Amazon Building a Kindle Set-Top Box? I'm awesome at photoshop! I hope it doesn't look like this! Amazon has a large content library. They are actively increasing it. Amazon has a content distribution platform already capable of streaming to non-PC devices. Amazon has a recurring billing relationship with consumers. Amazon has a (phenomenal) marketing and distribution channel for getting devices into consumers houses. Amazon has a strong brand in the hardware space. Amazon has the customer service & support infrastructure needed to deal with service issues. Amazon has the ability to build hardware and deal with supply chain issues. The TV services industry is huge, and Amazon wants in. Even if they don’t plan to decouple content from Amazon Prime, making a box is a very viable, and, in my opinion, a likely move. In addition to all of the above, it is a strong move versus Apple (and possibly Google and Microsoft too). A $99 Amazon Kindle TV box would not surprise me this coming holiday season (how about a September launch, right in time for school?). But then again, I occasionally get Kindle predictions wrong. Kinda saw this one coming, didn't ya? Roku already has something better than a minimum viable product. Amazon could skip all the work on developing a new UI/UX (regardless of your feelings on the Roku UX, it is well more than functional). Roku isn’t a sustainable business yet, enabling Amazon to purchase at a reasonable price. Roku has a team with a strong background and industry knowledge relevant to the TV/Device space. Amazon can distribute the same hardware at the same price point (which seems to fall in the not-too-profitably category), yet supplement with reliable recurring revenue. Amazon wouldn’t have to drop the Netflix service, but could slowly chip away at it from within. I don’t really think Amazon *needs* to buy Roku, but it would probably let them fast-track a bunch of steps. And then it could be a $49 Kindle TV, which just sounds so… right.